This year I taught ukulele for the first time, and it has been a blast! Until this school year, I had never even played the ukulele myself, so it was a whole new adventure. Today I'm sharing some of my top tips for any other music teachers who are just getting started teaching ukulele in a general music setting. I'm a huge proponent of concept-based curriculum. Basically what that means (because I'm pretty sure I just made that term up) is I don't teach things for the sole purpose of the thing- I choose things to teach based on what overarching skill or concept I want my students to learn. 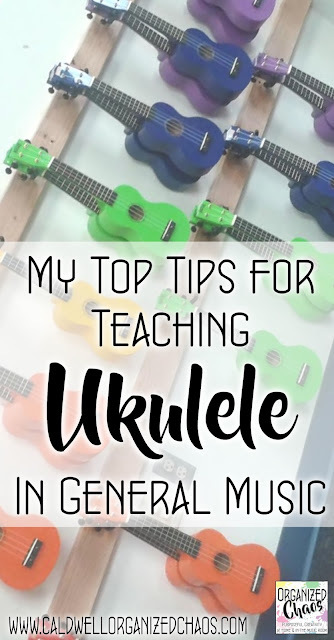 So although there is some benefit inherently in knowing how to play the ukulele, it's important for me to have more of a reason for teaching ukulele than just wanting students to learn to play the ukulele for its own sake. I chose to introduce ukulele to my 6th graders because I want my students to understand the concepts of chords, chord progressions, and chord functionality (at a very basic level). I've been teaching a unit on songwriting based in basic chord progressions for years now (here are the materials I use, which now include ukulele resources). When I first created the unit, I had students perform chords using familiar instruments that I already had on hand- boomwhackers, xylophones, singing voices, and a website called Jam Studio (really cool if you've never checked it out!). A couple of years ago when I started teaching my 5th graders about keyboard instruments (read about that in this post), I switched to using keyboards to teach chords, which was slightly more effective, but still there was a certain awkwardness in using any of these instruments for teaching chords, because playing multiples notes together did not come easily for my students. Ukulele, on the other hand, is created for playing chords! Besides the fact that it is physically easier to play chords on the ukulele compared to other instruments I used in the past, somehow the concept of chords itself seems to make more sense to students when they use a chordal instrument to play them! My point is, don't just decide to teach your students ukulele because it would be fun. Think through the purpose of learning ukulele for your students and how it will fit into your curriculum. 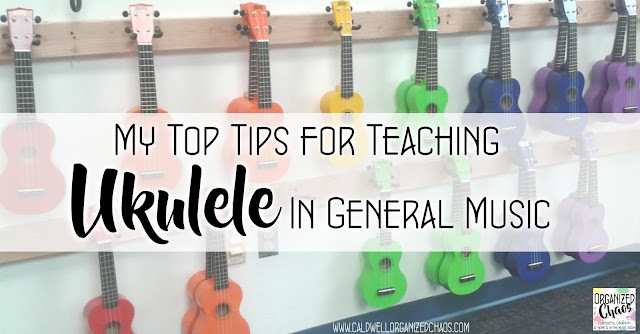 Once you know what your goals are for your ukulele instruction, it will make it easier to choose the resources you need to help your students reach those goals most effectively. I admit I haven't done extensive research or scoured the internet for all of the best resources out there, but here are some that I found that I have loved using! 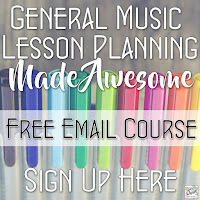 There are several great resources available for free online that will help you and your students get a good foundation, especially if you're aiming to primarily teach chords through the instrument like I am. Bernadette Teaches Music has an awesome YouTube channel that walks you through each of the basic chords, along with other ukulele basics like tuning, strumming, and more. Midnight Music has free ukulele chord diagrams you can download to project on a screen or print and use as posters. And once your students have got the hang of a few basic chords, this website has tutorials for several popular songs that can be played with just 4 chords. My students loved learning the songs I picked from this list! You can get by with just those free resources and get pretty far, but if you want something a little more put together for use in the classroom, I personally purchased the Sing and Strum Intro and One-Chord Songs set by Sing to Kids. It has some great teaching slides that make it easy to take students through the basics, especially with practicing strumming patterns. For a more in-depth curriculum (more for those who want to teach more note-reading and/or instrumental technique through ukulele study), the Rainbow Ukulele set by Pitch Publications is a great one. Of course any time you're getting started teaching ukuleles you're going to need instruments! I highly recommend this post by Shelley from Pitch Publications if you're looking at which ones to purchase. After watching her demonstration videos and reading about the comparisons, I settled on the Mahalo Rainbow ukuleles. I was able to get enough ukuleles for a class set, which I highly recommend. You could certainly make it work with half a class set, with students trading off, but they really aren't that expensive (relatively speaking) and there are a lot of options for getting funding! Ukuleles are pretty popular right now so I found I had little trouble getting them funded through DonorsChoose, which I highly recommend for purchases like these. You can get more ideas for finding funding in this excellent post by Jennifer from Sing to Kids, or this one by David from Make Moments Matter. Don't let a small budget stop you from giving students the opportunity to learn ukulele if you feel it will be beneficial for them! As you can see in the picture above, I have my ukuleles hung on the wall where students can easily get them and put them back themselves. I highly recommend this system if you have the wall space! As with any instrument students use regularly, I think it's important for students to learn how to handle them properly, and for them to be able to quickly and easily get them on their own. This is especially helpful when they use them later for composition projects or other activities where not all students are using ukuleles- they are always there and available if a student needs one. For tons of ideas on ways to store ukuleles in the music classroom, check out this post from Pitch Publications. The other thing I did was get different colored ukuleles to match my color group seating arrangement (those of you who know me are, I'm sure, not surprised at all!). Even if you don't have your entire classroom rainbow-ed out, having several different colors of ukuleles can be very helpful. Besides the fact that it's more fun (and looks pretty if they're stored in a visible location), it's easier for having small groups of students play for you ("all of the green ukuleles play this time"), or get out and put away their instruments ("all the red ukuleles can go back on the shelf"). Of course one of the biggest annoyances with teaching string instruments, especially with younger students, is the issue of tuning. I know a lot of teachers invest in tuners to make it faster and easier to tune. Since I was less concerned with teaching students the finer points of ukulele technique, I decided I was not going to teach my students how to tune at all- in fact, I told them they were not allowed to even touch the tuning pegs! I found that after the new instruments' strings settled in, it took me about 10 minutes to tune the class set of ukuleles. I also hand-picked a small group of students, most of whom had experience with other string instruments already, and trained them to be my Tuning Experts- we spent a few recess times practicing tuning the ukuleles properly, and after that, if I needed an instrument tuned during class (which was rare) and I couldn't do it myself, I had a few students who I knew I could trust to do it correctly without snapping any strings! 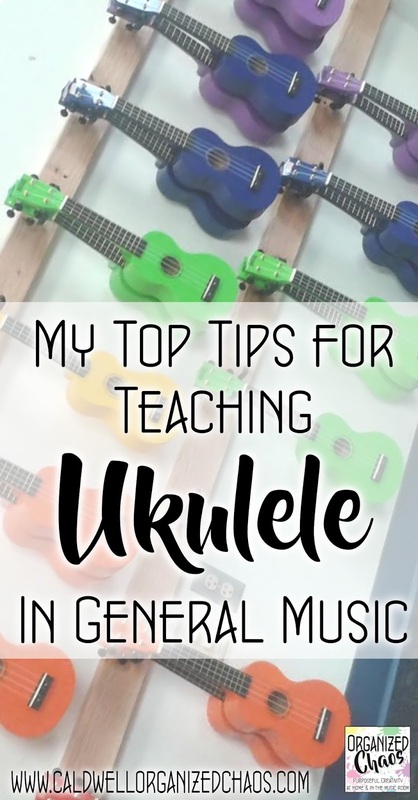 My students and I have thoroughly enjoyed learning the ukulele this year, and I think it is a real asset to my students' overall music learning! Have any of you started teaching ukuleles in the general music setting? I'd love to hear your top tips as well! Looking for more teaching ideas? See my full curriculum here. 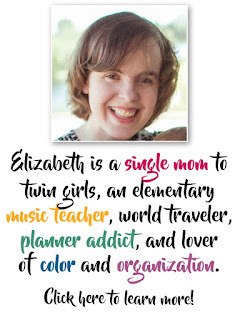 Elizabeth, I am an elementary music teacher and looking to start a ukelele program. I noticed your choice in ukeleles. Have they been quality enough to not be a distraction in terms of tuning etc.? I would appreciate your thoughts. Hi Dillon, I'm sorry I'm just now seeing your question- my apologies for the delay in responding! Yes, I have been happy with the quality of the instruments I have. At first they definitely took time to tune, but after a few months I found they only needed tuning occasionally and I'm happy with how well they have held up overall. I have probably asked this before but which system did you end up using in order to double stack your ukuleles? Thanks for your help!